The issue of food waste is about more than disposal of food scraps from our tables at home or uneaten food at restaurants. It is about hungry families and individuals, about wasting environmental resources during growing and processing, about over-purchasing, and about creating methane in landfills. There are at least three levels of the food waste story – local, regional and national. Locally, think about what you can do at home to limit your waste. “Imagine walking out of a grocery store with four bags of groceries, dropping one in the parking lot, and just not bothering to pick it up. That’s essentially what we’re doing,” says Dana Gunders, a National Resources Defense Council food scientist. On average a U.S. consumer wastes one pound of food per day, according to the National Center for Biotechnology Information. This includes moldy or unappealing foods in our refrigerator, expired foods – although often still edible – or stale items. Regionally, the impact of food waste is huge. 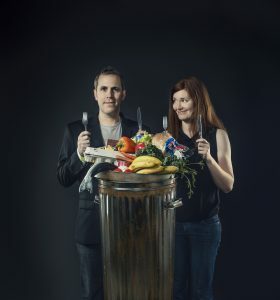 Ottawa County disposes of an estimated 23,434 tons of food waste through its municipal waste stream each year, not counting waste from agriculture and food processing operations, according to a West Michigan Sustainable Business Forum analysis. Waste food is the single largest source of material disposed of in the four landfills serving the county and amounts to approximately 17 percent of solid waste from residences and 14 percent from businesses. Nationally, that level of waste is multiplied. In the United States, according to the USDA Office of the Chief Economist/U.S. Food Waste Challenge, food waste is estimated to amount to 30 to 40 percent of the food supply. 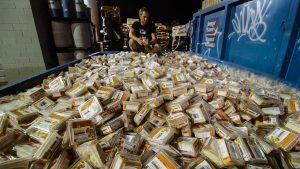 This amount of waste has far-reaching impacts on food insecurity for people who have difficulty accessing food, as well as for resource conservation and climate change.  Wholesome food that could help feed families in need is sent to landfills.  The land, water, labor, energy and other inputs used in producing, processing, transporting, preparing, storing, and disposing of discarded food are pulled away from uses that may have been more beneficial to society.  Food waste quickly generates methane, helping to make landfills the third largest source of methane in the United States. Visit www.OttawaFood.org to learn how 40-plus agencies and individuals are collaboratively working to ensure access to healthy, local and affordable food. Get involved if you can! Start a composting system at home, in your neighborhood, at your church or school or work with community gardens to process food scraps. Redistribute edible foods to individuals, families and organizations. These could be foods gleaned from farmer’s markets, event leftovers, or grocery outlets. 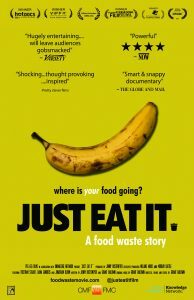 For a look inside the issue, attend the free showing of the documentary “Just Eat It: A Food Waste Story” at 7 p.m. Sept. 27 at the Knickerbocker Theater in downtown Holland.  Ken Freestone is Holland’s residential energy advisor and also co-founder of GreenMichigan.org, a nonprofit focused on sustainability. Lisa Uganski is a registered dietitian at the Ottawa County Department of Public Health and coordinator of Ottawa Food, a collaboration working to ensure access to healthy, local, and affordable food choices. Previous Previous post: Holland Energy Park Map.